Senior Kailyn Pedersen takes a quick nap in the middle of class in order to make up for her lack of sleep. 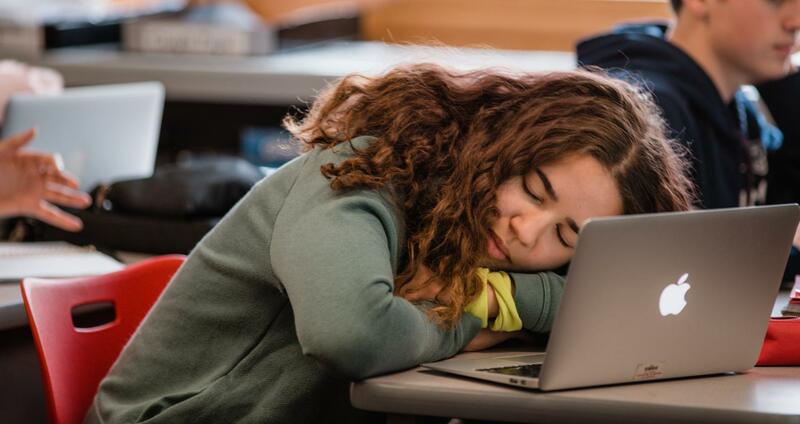 Nobody really gets the perfect amount of sleep they wish to have, but teenagers seem to be more deprived because of the demanding hours that come with being in high school. According to Nationwide Children’s, the developing brain of the average high school student needs between eight to ten hours of sleep each night––which may seem impossible for any BSM student who is trying to juggle school, homework, extracurriculars, and their social life during the short 24 hours in a day. Out of the 181 BSM students surveyed, 82% claimed that they don’t get enough sleep during the school year. Half of those students said they only get six hours of sleep at most on a weeknight. And, only two students responded with the recommended nine hours of sleep. A poor amount of sleep can cause lack of attention in school or even health risks in the long run. Sleep during teenage years is crucial, but the amount one gets depends on time management. In high school, it may be out of one’s control due to the stress of daily responsibilities. “I think lack of sleep is a combination of things. Homework amount, sports and activities, and phones can all play into that. 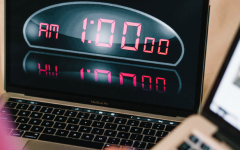 Even if I’m not directly using my phone to keep me awake, I could be on it earlier using it to procrastinate causing me to be up late doing homework,” senior Allison Brooks said. If students are asked why they get such limited sleep during the week, their first answer is typically because of homework and after-school activities. Although some may not admit it, procrastination is another main issue. Using technology to avoid doing homework, watching Netflix or YouTube late at night, facetiming friends, texting, online shopping: everyone’s guilty of it.“Sometimes I don’t have any self-control, and I stay on my phone late at night or end up watching Netflix,” sophomore Bailey Clark said. The average BSM student claims to wake up between five and seven in the morning. The result of a late bedtime and an early wake up can create a struggle to pay attention in school and an even bigger struggle to get work done during the day. “I’m normally really tired in the morning until lunch, which makes it hard to focus,” sophomore Claire Larson said. Health issues are a short and long-term problem teens should be worried about if they struggle to get the suggested amount of sleep each night. A chronic lack of sleep can lead to an ongoing list of mental and physical health issues that include concentration issues and can even weaken your immune system. “The lack of sleep can lead to a lot of problems with mental health.There are problems with your mood, stress, emotions, social well being, relationships, irritation and a lot more. The block days were instituted to help with that because kids are way too busy during the day to do all their homework and get enough sleep,” health teacher Ms. Alisa May said. Students are aware of the common problem of procrastination and are trying to improve their habits. It may be hard to commit to better time management, but trying to get as much homework done at school or before a sport can make a difference. “I’ve been trying harder to finish my homework on time and get off my electronics earlier before bed,” sophomore Ananya Yogarajah said. Other students have different tactics that allow them to finish homework on time, but can result in odd sleep habits. “Sometimes I like to go to bed right when I get home and wake up really early in the morning to do my homework before school,” junior Joe Marinaro said. Although it’s easier said than done, both reduced time on the internet and better time management skills will lead to longer sleep time and better performance in school. By senior year, students have most likely learned what methods work best for them. “I normally go off my phone at ten and try to do my homework right when I get home from school so I don’t have to do it late at night,” senior Nikki Clark said. Sports are another main cause of poor sleep habits with students at BSM. Most claim if they get home late from a practice they have to stay up late studying or doing homework. When an athlete is occupied with long practice and homework hours their sleep will become jeopardized.“One’s amount of sleep will definitely dictate their athletic performance. I can recall countless instances of me doing certain physical things, and immediately feeling the strain of not enough rest holding me down, like having to do whatever it is but with more weight on board,” senior Santiago Jimenez said. It’s very common for a teen athlete to suffer from sleep deprivation, but at the same time, athletes are recommended to get more sleep than normal. With 24 hours in a day, the normal tasks of a high school student become almost impossible when one adds a sport. “Being in a sport definitely affects my sleep schedule not necessarily for lack of time–––because honestly, I would probably start my homework at the same time anyways––but just because I usually get really tired after my sport, and all I want to do is sleep. Sometimes I have to set my alarm for five in the morning because I can’t get the energy and motivation to do it at night,” Brooks said. Homework, procrastination, and after-school activities are very common ways that the average teenager can lose sleep. By senior year, the annoying lack of rest is something each student can reflect on and potentially regret. “After all these years, I believe that my brain might just already be permanently screwed, or fried, or whatever. All I can say is that I strongly advise against anyone getting themselves sleep deprived for no good or apparent reason, and that, despite being able to somewhat ‘live’ this way, I desperately want it to end, but I just can’t seem to get out of it,” Jimenez said. The BSM staff is conscious of the busy schedules that students struggle with during the year and try to structure their lesson plans in order to help increase sleep. “Most students have a really packed schedule nowadays which does become a challenge for students because sometimes it seems like they have more to do with not enough time to do it. I try to give my students a calendar for the next three weeks with the hopes that if they know they are going to have a lot of work coming up that they can do it the weekend before,” Ms. Cherie Vroman said.